After the students left, things at Seaview got much quieter. With the students back in NYC, trying to stay warm and dry, our site crew was drastically reduced. I was very pleased with the effort and enthusiasm of all the students working at Seaview. All phases of the excavation went very smoothly and the students never hesitated to lend a hand with any task, whether that was troweling back a particularly interesting context or simply running buckets back and forth between the trench and sieves. In spite of the short amount of time the students were able to spend in Barbuda, and the sometimes frustrating nature of island life, I believe the field school was successful in providing a hands-on learning experience, demonstrating first hand how archaeological data is obtained. As the videos posted here will show, each student had a unique perspective to share. Considering the wide range of skills and processes that they were exposed to over a relatively short period of time, it should prove interesting to find out exactly which aspects of the project were most influential. Even though the work slowed a bit with fewer people on site, much progress was made. The entire area excavated was 68 square meters, including the initial 5x10m trench and a 3x6m extension. This area was designated ‘Area C’. We uncovered a series of sunken features, over 50 in all, varying in size and shape, scattered across the trench. Sorting out the function of these features is a work in progress, but it is certain that the prehistoric Saladoid occupants of this site were using the area for a wide range of activities. Associated with the sunken features were a large quantity of pottery, shells, bones, charcoal, lithic tools, and beads. Going into the field season we were unsure as to the nature of the activities carried out in this area, but it is now clear that this was a long-term settlement. There are numerous interpretations of the archaeological materials and features, including post holes supporting ancient structures, cooking and storage pits, and activity areas for working with organic materials, lithics, or beads, just to list a few. What this area does not represent is a midden deposit. The midden excavated in 2008, along the coast, is clearly separate from the area excavated this year. It looks as though the inhabitants were walking up to the top of the ridge and dumping garbage over the edge, towards the sea. However, the area on the near side of the ridge, including Area C, was used for a range of domestic activities. More details will be known once I have gone through all the drawings and photographs and can synthesize all the data recovered this season. 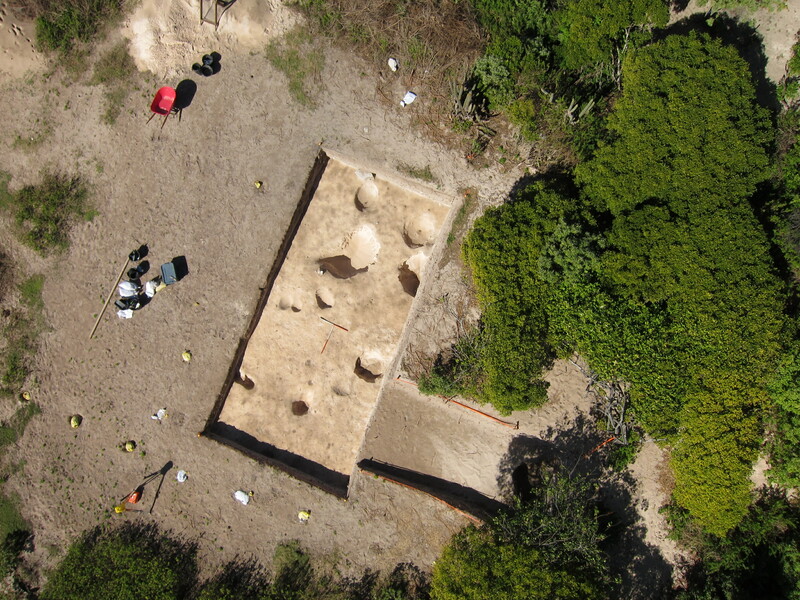 It is very exciting though, as this would mark the earliest Saladoid settlement in this part of the Caribbean! Student videos will be included in the coming weeks. For now, here is a site picture taken from a kite. This method of aerial photography proved very effective. We got a number of great shots using a very simple point-and-shoot digital camera suspended from a relatively inexpensive kite.